Creating simple modals by using Bootstrap framework is written here. A nice jQuery plug-in (bootstrap3-dialog) is also covered here. Another tutorial for minimizing and maximizing the modal windows can be found here. 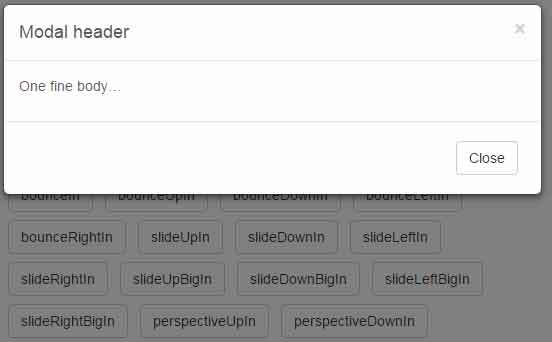 I also covered popover enhancement plug-in for Bootstrap popovers here. In this article, the Bootstrap popovers and modals are created with animations of different styles by using the vanilla.js component. <li><a data-original-title="Heading of the popover" data-animation="false" data-easein="flipXIn" href="#" class="btn btn-primary"
You can see codes of all modal windows in the demo page. How to setup these popovers and modals into your website? As your project is based on Bootstrap, so it is highly likely that you have included the CSS and JS files of Bootstrap along with a reference for the jQuery library. For creating animated popover and modals, you also need to include the references of velocity.min.js and velocity.ui.min.js.